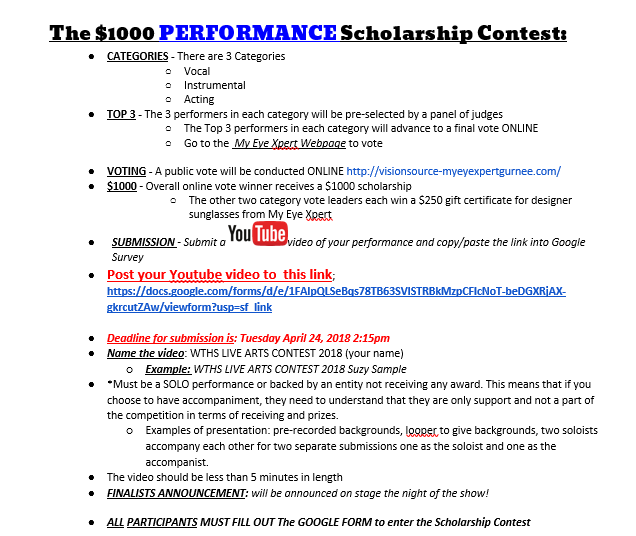 Please read the following information carefully if you would like to submit a performance for the Live Arts Scholarship Competition. The top 3 performers in each category are pre-selected by a panel of judges. The top 3 performers in each category will advance to a final vote ONLINE. The overall winner with the most votes will receive a $1000 scholarship. The other 2 category vote leaders each win a $250 gift certificate for designer sunglasses from My Eye Xpert. Record a video and upload it to YouTube. Video should be less than 5 minutes. **Entries must be a solo performance or backed by an entity not receiving any award This means that if you choose to have accompaniment, they need to understand that they are only support and not part of the competition in terms of receiving prizes. Remember to cast your ballot thoughtfully. Read their posts, and choose your pick wisely. These young men and women will be your leaders and guides in Drama Club next year, and you want to have good strong representation. Read through the officer duties, so you understand what each position is. Supports other officers as needed.